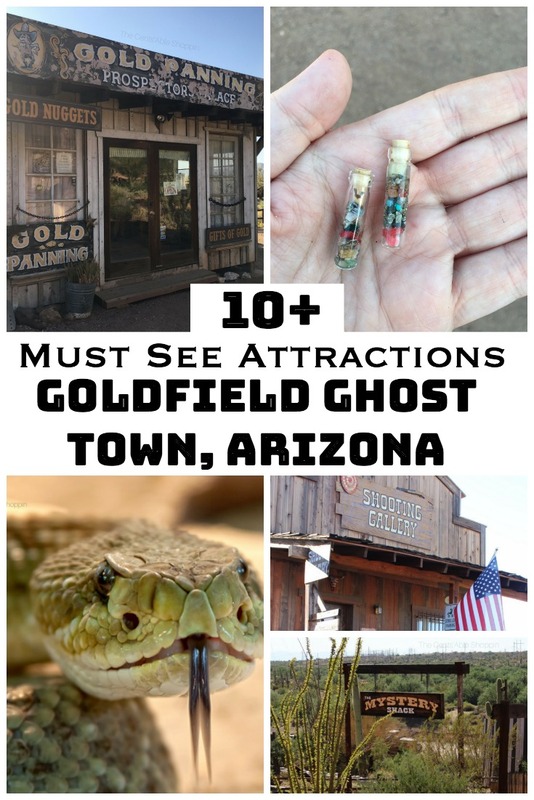 When the weather starts to cool down in Phoenix, one of the best places to visit is Goldfield Ghost Town. 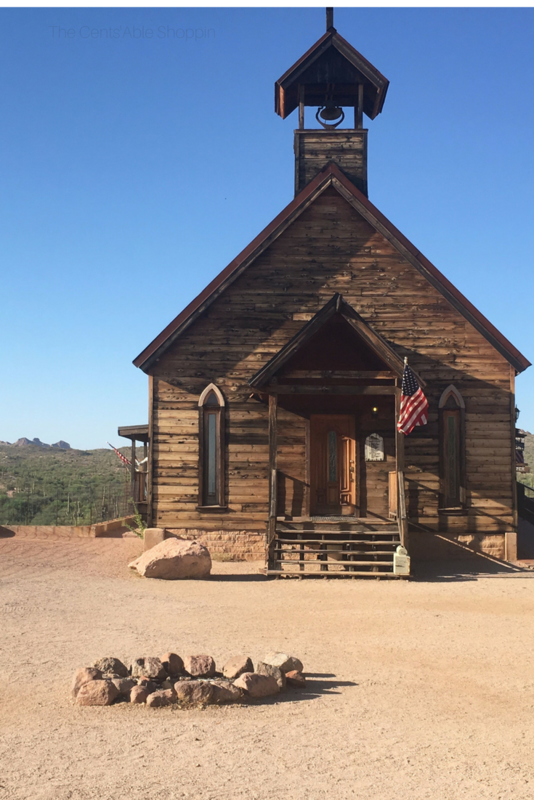 The ghost town is open all year long, but high summer temps can be a scorcher – especially if you aren’t too fond of being outside in the hot, Arizona sun. I’m not sure if that’s due in part to the Ghost Adventures episode that they watched on Goldfield (check out Hulu, I believe it’s Season 9), or because they truly love the town… nonetheless, every time we go there, they have a blast and they come home having learned even more bits and pieces of Arizona history. 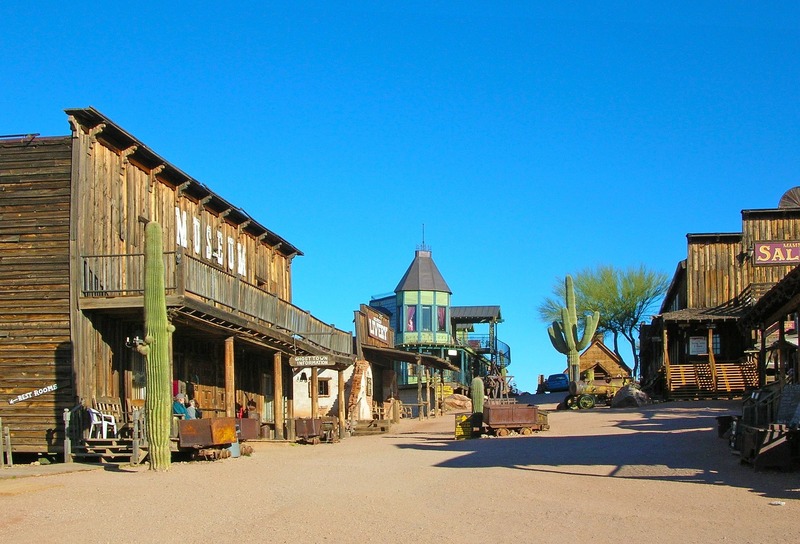 Goldfield Ghost Town is 35 miles southeast of Phoenix just outside of Apache Junction. It’s a pit-stop on the way to Canyon Lake in the far East Valley, and a popular place for tourists to visit when they come into town. 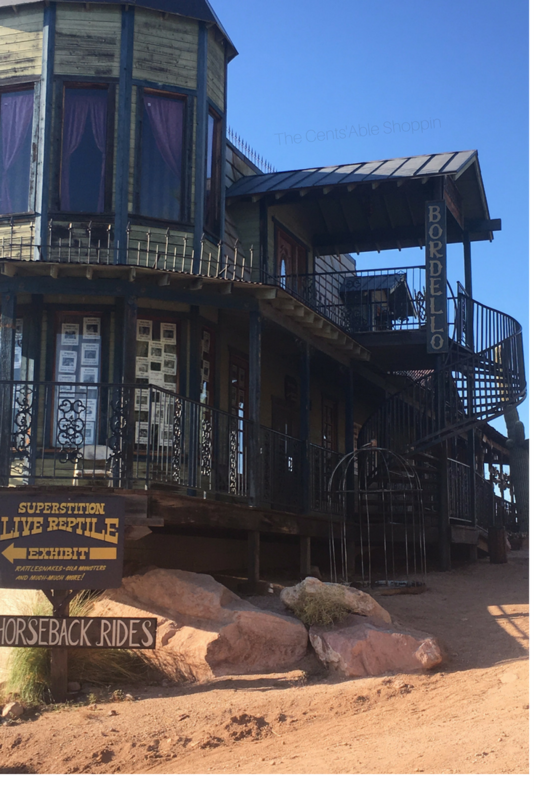 But tourists aren’t the only people the town attracts – many locals head to Goldfield to see the attractions the town has to offer. 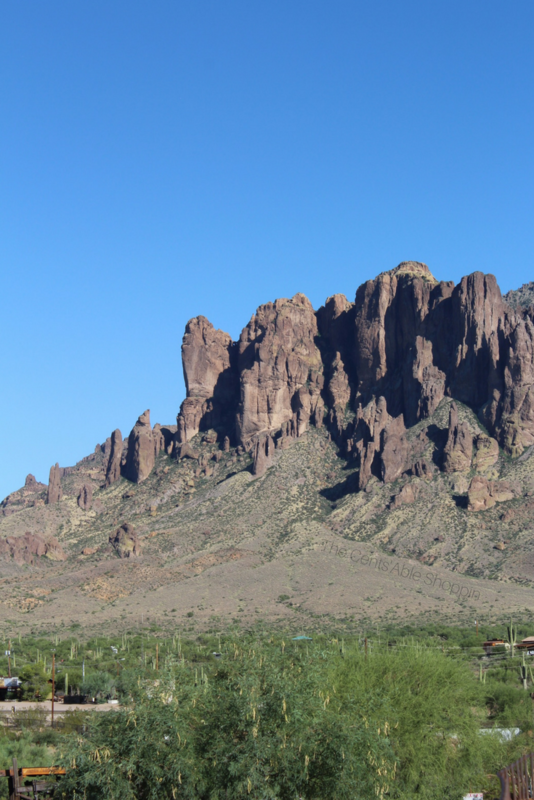 I’d be lying if I said I went there just for the attractions though – I absolutely love the scenery – who wouldn’t want to look at the Superstition Mountains? Goldfield goes back in history to 1892 – a gold strike worth just over 3 million dollars put the town on the map. In its day, the town had a vibrant population of four thousand people in addition to a blacksmith, school house, hotel, post office, general store and more. The town was originally called Youngberg, named after George U. Young arrived in 1893. The town grew quite large with the promise of wealth from several nearby mines. Just a few years after the gold strike, a break in the gold vein and the grade of ore dropped – which caused the population to decline. Over the next ten years, there were many unsuccessful attempts to reopen the mines, but eventually attempts were halted and the mine never came back to life. In 1983, Robert “Bob” Schoose, a ghost town and treasure-hunting enthusiast, originally from California, bought a five-acre site that was once the location of the Goldfield Mill and rebuilt the old town. 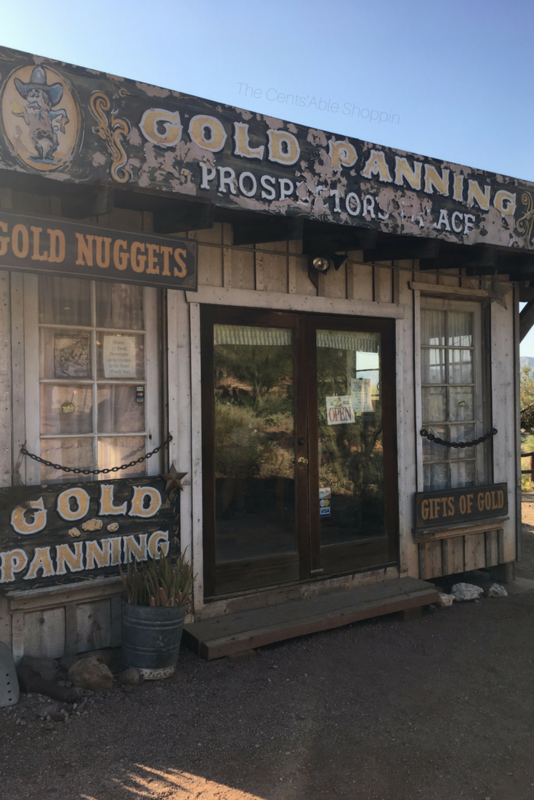 Today you can visit Goldfield with your family – the town has authentic buildings, tours, a train ride, shops, and a saloon – it’s a wonderful learning experience for kids and a fun afternoon for the family. 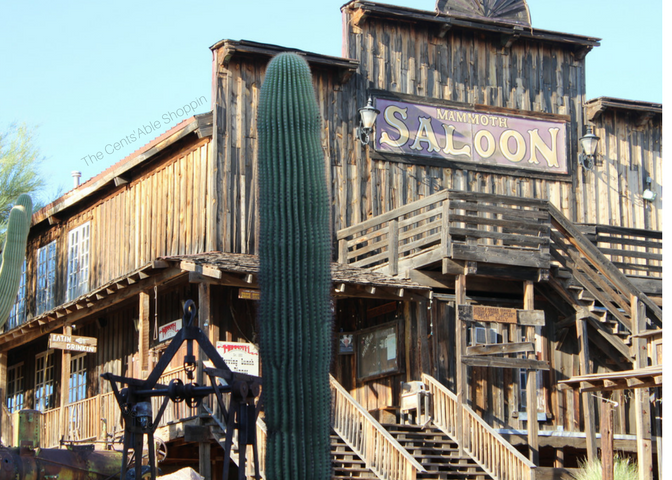 If you head out to Apache Junction to visit Goldfield today, you will get a sense of history from participating in any of the various activities and tours the town offers. The town is the only real ghost town in the Valley – and before heading over, I would encourage you to catch the episode of Ghost Adventures (Hulu – season 9) to get a feel for the strange oddities that occur after dark at the town, once everyone has gone home for the day. This is a wonderful place to take a homeschool field trip (and is the reason we go back!) 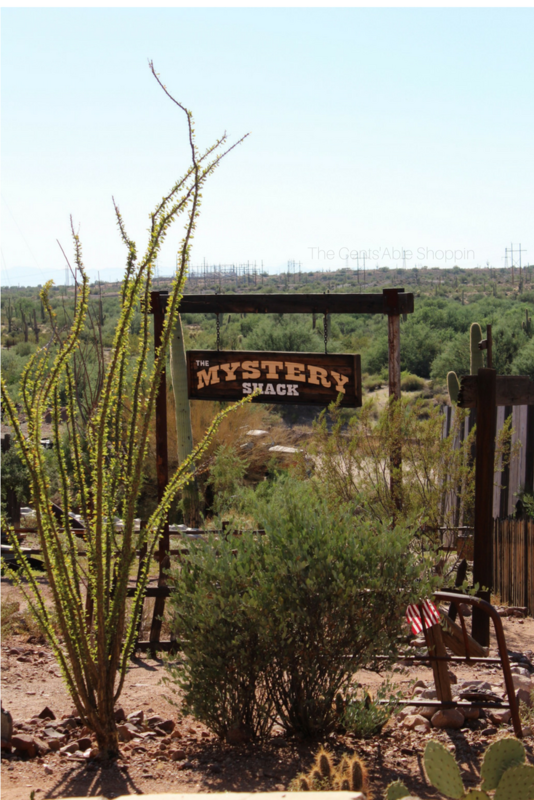 The shack is known for its legends of mystery within the Superstition Mountains. In 2009, an old miner’s house was restored and moved to this particular section of dirt within Goldfield Ghost Town. Oddly enough, 100 years later, the miner’s house, generates a vortex that defies gravity – hence the name The Mystery Shack. Within the shack, people walk at 45 degree angles, water runs from the faucet without being connected to pipes, and objects hang from above at 45 degree angles – you’ll also see a pool table that has balls that always go into the same pocket. On your way out of the shack, you’ll walk over a 1,500 ft mine shaft (of the second largest aquifer in the state of Arizona). It’s a neat place to take kids- I’ll admit though, it’s really hard to walk when you are carrying a baby in a carrier. Such a great place for kids of all ages. Kids and adults alike can shoot interactive targets that come to life. You can compete between friends and family, while also having an opportunity to see unique guns, and bullets (that are for sale). The facility is at the rear of the Ghost Town, up the hill and behind the church – it’s wheel chair accessible. This is a must if you have kids! 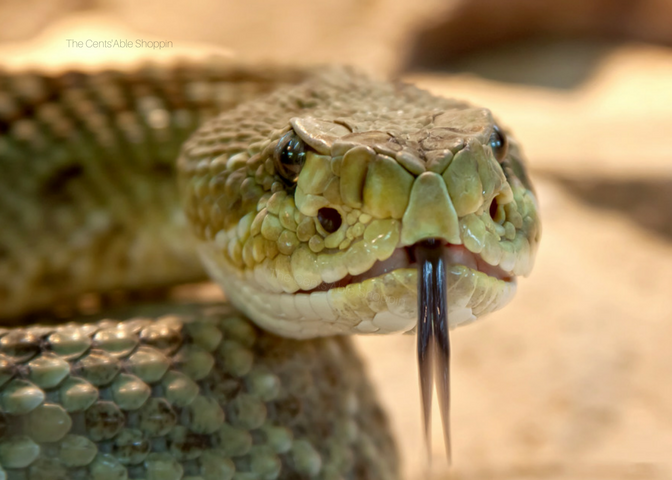 Visit the many reptiles that are on display – they have various species and animals on live display – some seasonal and others year round. 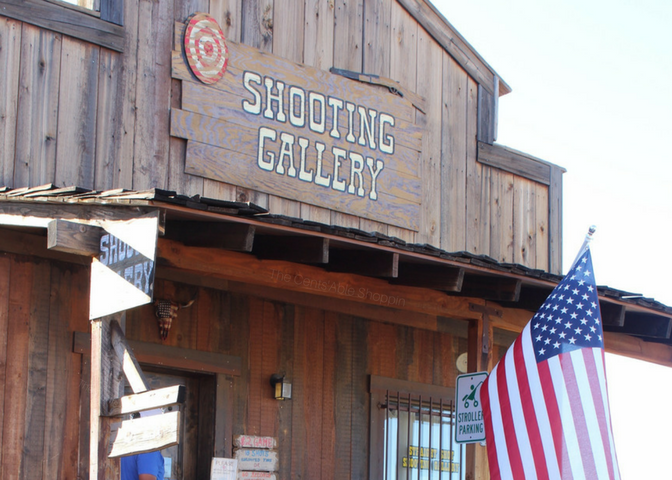 See the gunfighters walk the streets on the weekend only, on the hour 4 times each day. The kids will love to see a live rendition of the old cowboys and cowgirls of the West. They’ll even have the opportunity to snag a picture outside the town jail. This railroad tour tells the history of Goldfield, the Superstitions, and the desert Southwest, on the only narrow gauge railroad in Arizona. The tour is approximately 20 minutes and runs a mile and a half around town. The train departs every 35 minutes. The museum was featured in the episode of Ghost Adventures and features many interesting exhibits that pertain to the history of the town and surrounding area. You’ll want to make sure you catch the exhibit on the Lost Dutchman gold mine – one of the most famous mines in the country. 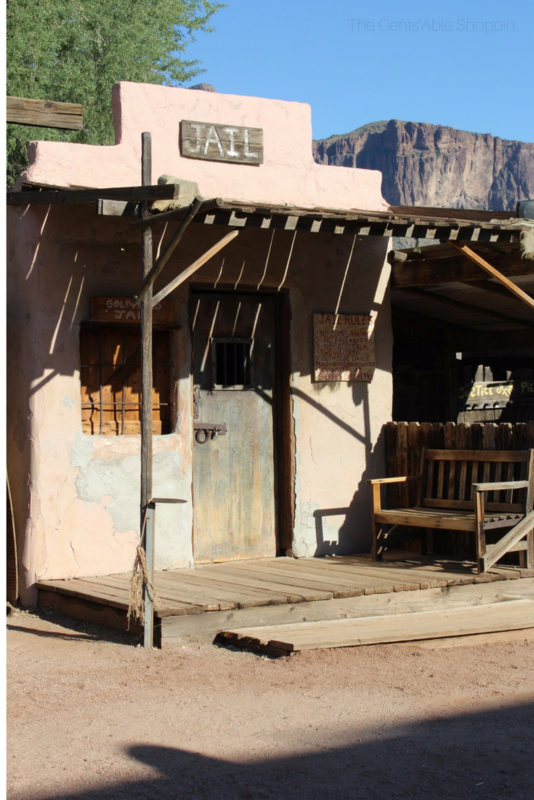 The second floor of the museum showcases westerns that were filmed in and around the Superstition Mountains. The mine tour is one of the most incredible tours of Goldfield. The tour is an underground, guided tour that takes you back in time 100 years ago. You’ll learn the history of the mine, equipment used, and mining procedures – you’ll also hear about some of the hauntings experienced in the mine. 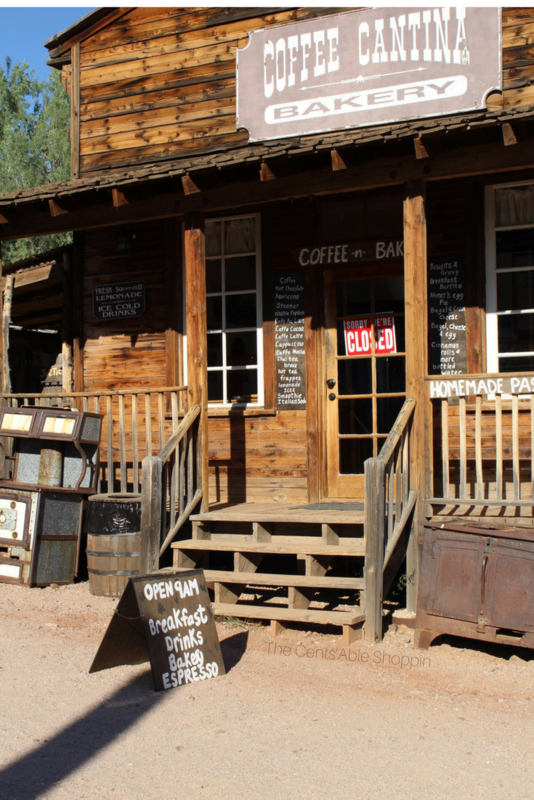 No trip to Goldfield Ghost Town would be complete without a visit to the coffee and cantina – open from 9 a.m. to 5 p.m., they serve up breakfast, hot drinks, espresso and more. If you love sweets of any kind, they have the best cinnamon rolls and seven layer bars. You can grab hot chocolate in the chilly Phoenix winter and sit at the tables on the patio to watch people or take pictures of the area. The tour of the bordello takes 15 minutes – kids and adults are welcome, and cameras are encouraged. Take a guided tour and learn about the girls (Floozy’s), the women of the 1800’s, and their roles in the development of the Western territory. Take the kids to pan for gold – you’ll meet a real gold historian that will teach you how to properly pan for gold, and kids/adults will be able to pan for small slivers of gold (and be able to take them home). 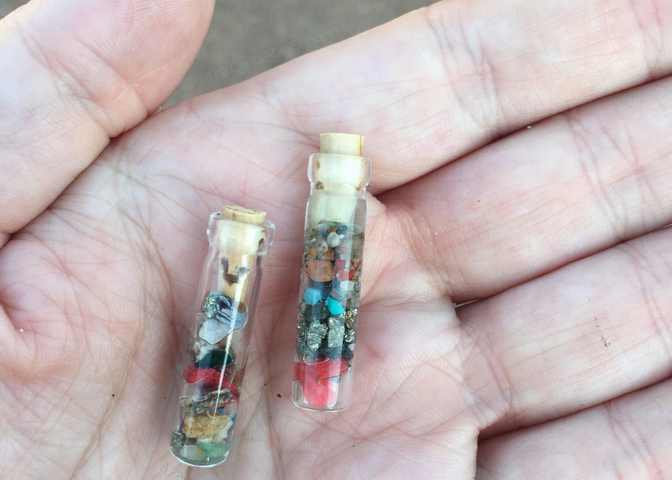 Our kids had the most fun gold panning – they spent about an hour sifting through, they all got along wonderfully and they were so thrilled to take their own little bottles home! Of course.. that’s not all that the town has to offer :) That’s ten of our favorite things to do – but the town has MUCH more that you can see. Visit the Ice Cream Parlor and grab a burger to eat while you are there – the view of the mountains is incredible! Head up to the top of the hill and visit the Church on the Mount – a 24 x 36 ft church with room for 132 people. Regular Sunday service is held at 11 a.m. and the church is open to the public. 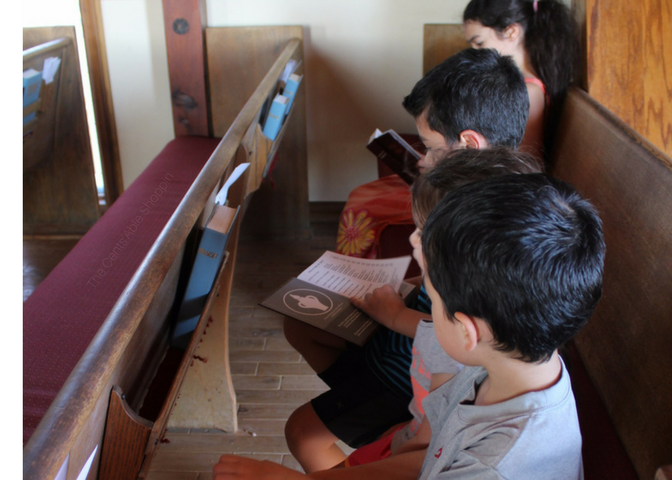 During the week, you can visit inside the church – sit in the pews and read scripture. The highlight of Goldfield Ghost Town is being able to visit the Tomb of the Unknown Prospector – just next door to the Goldfield Train Ride. Goldfield Ghost Town is located off Mammoth Mine Road, just off Apache Trail. You’ll head to the East Valley on US60, and exit on Tomahawk, and go north. Take a right (go east) on Apache Trail, and follow the road until you see the Ghost Town on your left. To see everything the town has to offer, it’s best to visit on a weekend, between the hours of 10 a.m. and 3 p.m. 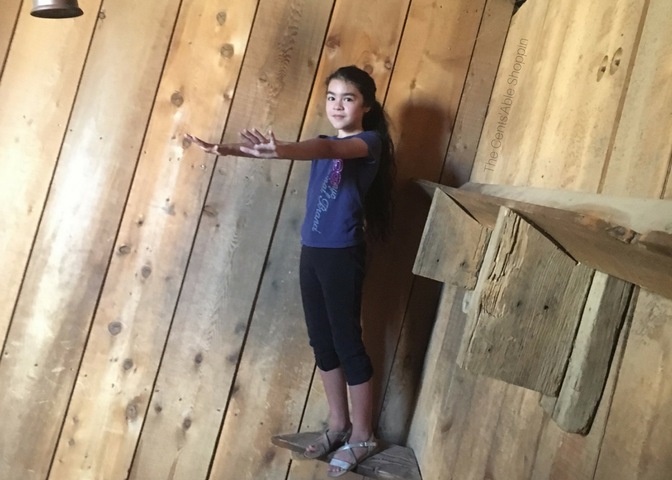 If you have kids and time during the week, some of the attractions are wonderful for a homeschool field trip. 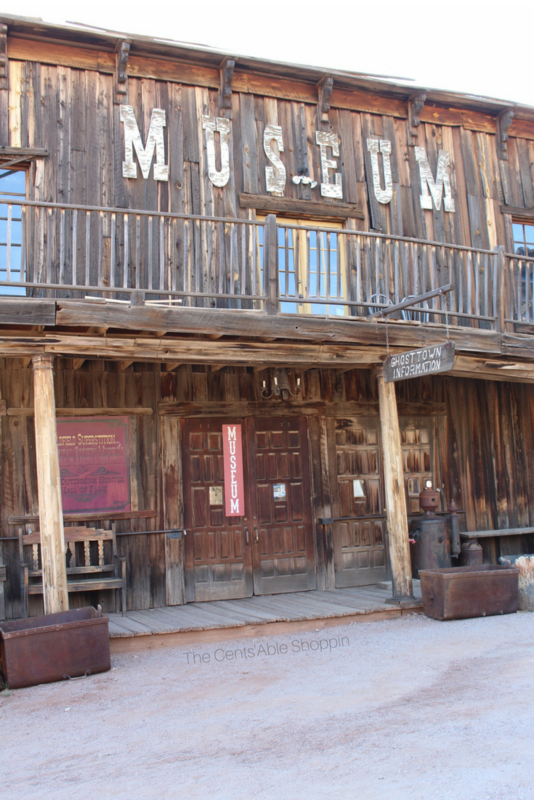 Have you been to Goldfield Ghost Town? If you have, what was your favorite attraction?